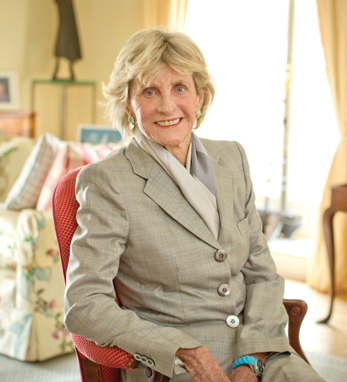 Often referred to as the shy Kennedy, Jean Kennedy Smith has quietly blazed her own trail while still holding true to the family legacy of public service. The last of the Kennedy siblings still living, Kennedy Smith has devoted her life to advocating for the disabled and working towards peace in Northern Ireland. Kennedy Smith was appointed ambassador at a crucial moment in the Northern Ireland Peace Process and played a pivotal role in the issuing of a U.S. visa to Sinn Féin President Gerry Adams. In September 1998, seven months after the historic Good Friday Agreement, she resigned as ambassador. Ireland’s President Mary McAleese praised Kennedy Smith’s “fixedness of purpose” during a ceremony in 1998 which conferred honorary citizenship on the U.S. Ambassador to Ireland as her four-year term came to a close. Taoiseach (Prime Minister) Bertie Ahern paid tribute to Kennedy Smith’s “immense service” during her tenure, saying, “You have helped bring about a better life for everyone throughout Ireland.” The Massachusetts native described her ambassadorial term as “the most remarkable, most exciting, most rewarding years of my life.” Kennedy Smith returned to the U.S. shortly afterward and in May 2000, she developed a cross-border Irish arts festival, featuring dance, music, visual arts, literature and theater. Kennedy Smith has always kept a lower profile in comparison to her siblings. Now 83, she rarely gives interviews, though she did give one in January in relation to the 50th Anniversary of her brother’s presidential inauguration. As ever, family is still a priority. In August 2009, Kennedy Smith chose to miss her sister Eunice’s funeral to stay by Edward Kennedy’s side as he was dying of cancer. Now, she is the last of the nine Kennedy siblings, though she does not dwell on that, focusing instead on the here and now. Since leaving diplomatic service, Kennedy Smith has received numerous accolades for her work to bring peace to Northern Ireland and for her work with the disabled. She has received honorary degrees from multiple institutions. In 2010, she and the late Sen. Edward Kennedy were named the recipients of the 2009 Tipperary Peace Prize. Most recently, Kennedy Smith was awarded the Presidential Medal of Freedom by current President Barack Obama for both her diplomatic service as well as her humanitarian efforts.